Most of us use the copy paste function to paste lot of data from the internet into Microsoft Office Word. But, we like to keep the same font throughout the document. It’s annoying when you paste the text which has some other font and you need to change it later. So, to avoid text being pasted with formatting, here’s a simple tip. 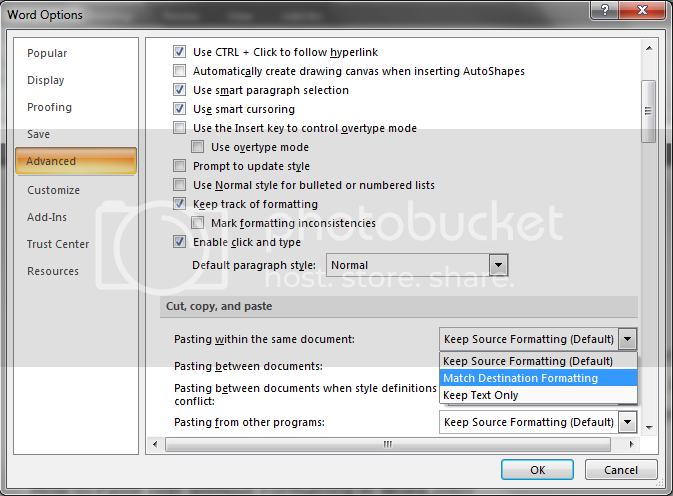 If you’re using Microsoft Office Word 2007 then you can disable formatting with ease. To do so, click on the Menu orbit button and select word options. Now, on the left hand side click on the advanced tab. On the right hand side, under ‘Cut, Copy and Paste’, you’ll find three options- Pasting between documents, Pasting between documents when style definitions conflict and Pasting from other programs. In the drop down menu, ‘Keep source formatting’ is the default option that’s selected. To disable pasting text with formatting you need to select ‘Match Destination formatting’ or ‘Keep Text Only’ in the drop down menu.